Simon B has now generated this 2013 season’s stats which you can find by looking under the Statistics menu item above. A pleasant evening at Stalbridge started with us losing the toss and Stalbridge deciding to bat. Harry Woolway and Rueben Salisbury opened the bowling to maximum effect. With Harry taking 4 wickets and Rueben taking 2 within the first 8 over’s. This continued with Angus Davis taking another 2, Tom Dunn and Max Chinnock finishing them off within 13 over’s for a small total of 48 runs. Throughout the innings the whole of the fielding was outstanding and overwhelming for Stalbridge. The first two batsman were Harry and Tom and within 4.2 over’s they had between them easily reached the target with some very big hits (inside the tennis courts)! A presentation was held straight after the match where it was confirmed that Buckhorn Weston U15’s had achieved the Double by winning both the League and the Cup. I would like to thank all the young players for their outstanding effort and behavior during this match and the excellent sportsmanship portrayed by all. They are all a credit to Buckhorn Weston Cricket Club and have always been throughout the years I have coached them. I would also like to thank all the parents for their commitment over the past years. Finally, on another note I would also like to congratulate the U13’s for their successful season by reaching the U13’s Cup Final and finishing 3rd in their League. On a beautiful summers evening an under strength Buckhorn side (John Copper, Alistair Johnson, Tommy Ferguson, James Paterson, Grady Crittal and Rory Spence) beat K&S in the last over of a thriller. Led strongly by John C Buckhorn won the toss and decided to bowl. Tight work by all, espcecially John, Rory and Tommy restricted the oppo to 96 for 5, with John taking 2 and Rory 3 wickets a piece. Knowing that they couldn’t afford to loose wickets Buckhorn lost Alistair third ball. But John and Tommy both batted very well and sensibly. John was eventually out on 27, but Tommy continued with support from James, Rory and finally Grady. With only 2 overs left and 1 wicket to loose, Buckhorn needed 15 to win. Solid defence from Grady allowed Tommy to hit the winning boundary with 4 balls to go. A great win! BWCC WIN RANSTON LEAGUE – DIVISION 1 !! After a damp and murky day a great League match took place in the early evening at the Buckhorn ground. Having lost to Buckhorn in the Cup semi-final the previous week Stalbridge were looking for revenge. Having won the toss Buckhorn put Stalbridge into bat and despite some short-ish boundaries the opposition only managed to accumulate 92, all out. As has become the norm the team bowled and fielded superbly. All the bowlers – John Cooper, Sam Godfrey, James Paterson, Alistair Johnson, Ed Munday and Ollie Corner stuck to their work and bowled tightly and with aggression, especially with a wet and greasy ball to start with. Particular mention must go to James Paterson who took 3 for 14 from 3 overs. Despite being gifted a wicket with his first ball he bowled very well. Copper, Godfrey and Johnson got the other bowler taken wickets and Munday was very unlucky not to join it. But, as has also become the norm, the Buckhorn batting lacked depth, with only two batsmen getting into double figures (Alistair Johnson – 33 and Dodd – 18). The next highest score was 4. Something that must be worked on. Despite all of that the team got to 83 for 7 in the last over. A gutsy team effort. More batting application required! 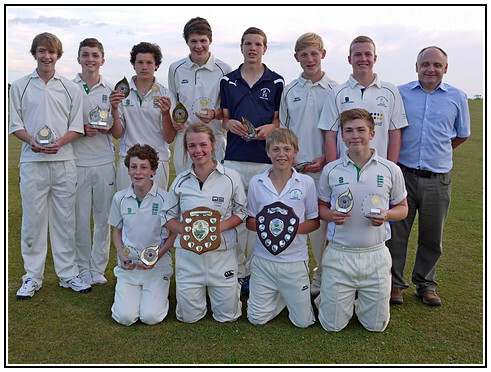 A strong and confident Buckhorn side took to the field against the Stalbridge Blues in the North Cup Final, on Tue. 4 June. Having won the toss and put Stalbridge in to bat all 4 Buckhorn bowlers – Tommy Stewart, John Cooper, Alistair Johnson and Sam Godfrey bowled well, with a single wicket each for Cooper and Godfrey. The rest of the team supported superbly in the field, but Stalbridge somehow still managed to accumulate 132 for 2. Buckhorns reply never really got going with only Stewart (17) making double figures. The side was eventually out in the 15th over for 74. A pretty comprehensive victory, but Buckhorns team spirit was not dented and there were more than signs of the shape of things to come with many of the players showing really talent and application.